Maytree Nursery and Infant School, we believe that good attendance and punctuality are important in helping pupils achieve the best that they can be. Education is important. Pupils should be at school on time and ready to learn, every day the school is open, unless the reason for absence is unavoidable. All research shows that pupils who attend well achieve well. Every day at 9.00am a register is taken by the teacher and then again at 1.00pm. The registration mark provides the Headteacher and Attendance Officer with data which is converted into a percentage attendance mark. Each pupil has an individual registration sheet which is regularly analysed. Absences are also captured on the registration sheet. Authorised absence: is an occasion when a child is absent from school for a legitimate reason and the school has received notification or evidence from the parent or carer. A child is unwell and the parent provides supporting evidence such as telephone notification, a medical appointment card or prescription. For a period of sickness, the absence to be categorised as authorised, confirmation of sickness must be received daily. Sickness absence exceeding three days will only be authorised after supporting evidence has been submitted. One day for religious observance such as Eid or Vaisakhi. Parents do not have the authority to make an absence authorised. Absence classification is at the Headteacher’s discretion. Unauthorised absence: is any occasion when a child is absent from school without the permission from the school. An example of this is a child taking a holiday in term time. Unauthorised absences should be avoided and will be investigated by the school. Repeated incidences of unauthorised absence will be considered of great concern and a meeting may be requested to investigate these fully. Maytree School actively encourages good timekeeping and discourages late arrivals. Patterns of late arrival will be monitored and consultation will take place with parents. Code I: Illness. Where, over the course of an academic year, a child has repeated periods of illness, the school will write to parents to ask them to provide medical evidence for each period of illness related absence and the school may inform parents that any further illnesses reported to them will not be authorised unless they see a Doctor or have a Pharmacy First Appointment with a pharmacist and provide evidence to the school. We may also make a home visit to check on the welfare of the child after 3 days. Medical evidence could be a Doctor’s note, appointment card, Pharmacy First dispensing label or copy of a prescription. We may seek written permission from you for the school to make their own enquiries. Code G: Leave not authorised by the school or in excess of the period determined by the Headteacher. The Headteacher will only authorise a leave of absence in exceptional circumstances and these are to be at her discretion. A leave of absence for the purpose of a holiday will not be granted as authorised. Should parents still take the child out of school, or the child is kept away for longer than was agreed, the absence is recorded as unauthorised. Parents are potentially liable to be subjected to a Fixed Penalty Notice if the absence is in excess of 10 sessions. The regulations do not allow schools to give retrospective approval. Our attendance motto is ‘’Every Day’s Important, Every Lesson Counts’’ and our mascot ‘Edi’ is used to raise children’s awareness and motivate good attendance. Good attendance at Maytree School is 96% to 100%. Maytree School will write to parents/carers at various times during the academic year to advise of their child’s percentage attendance mark. Attendance also forms part of the Parents Evening discussion and the end of year school report. If a child’s attendance drops to levels of concern by the school, then parents will be contacted in addition to these times. On Friday afternoon classes are presented with a Gold, Silver or Bronze attendance award for the week. The awards are calculated by the Attendance Officer and collected by classes on an Attendance Reward Chart, which is highly visible in the classroom. Classes with golden attendance earn extra golden time. The class with the best overall attendance in a week is presented with The Maytree Attendance Cup. During a half term an ‘Attendance Week’ takes place. This also raises the profile and importance of attendance within school and with parents. 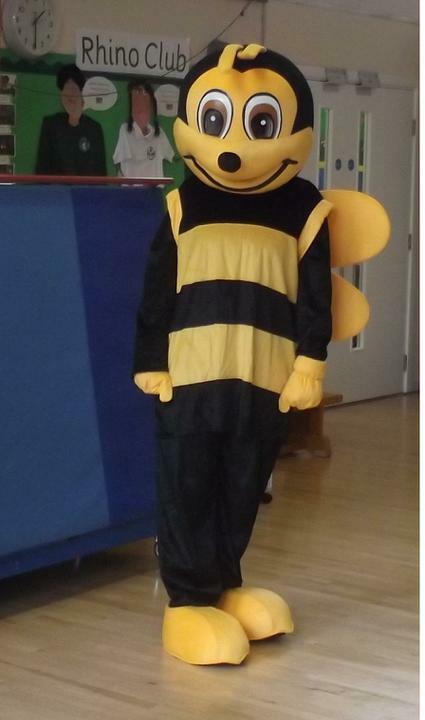 The school attendance mascot ‘Edi’ and the Headteacher greets children at the school gate in Attendance Week. On Friday afternoon all children with 100% attendance in the week are presented with a good attendance sticker in attendance assembly. On the last day of term, children who achieve 100% attendance since the start of the academic year are invited to attend an attendance celebration event. The Headteacher will present certificates to children and give praise to parents for their support. Children who achieved 100% attendance in a half term period are presented with certificates by the Headteacher. Because it is important for children to establish good attendance habits early on in their school career, the Headteacher and the governors support good attendance and identify and address attendance concerns promptly. In school we depend upon parents to ensure their child attends school regularly and punctually and therefore where there are concerns regarding attendance parents are always informed. This usually occurs once attendance drops below 95%. There will be opportunities for the parent/carer to discuss any support which could be given by the school with the aim to improve attendance. Where a child’s attendance record does not improve over a period of time then the school has a responsibility to make a referral to the Educational Welfare Officer (EWO) who may offer more focused support. The EWO visits once a term to check and monitor attendance and carries out regular register checks to identify children with very low attendance. Whilst the EWO works with the school to improve attendance they may potentially, where attendance does not improve, issue fixed penalty fines. In some cases fast track prosecution could occur if attendance support meetings held by the school do not improve attendance. Parents/carers must inform the Headteacher of their intention to take their child out of school during term time. In the first instance a parent /carer must complete an Absence Request Form from the school office. Once the form is completed a meeting with the Headteacher will take place and the reasons for the absence request will be discussed. Absence classification (authorised or unauthorised) is at the Headteacher’s discretion. Parents whose absence is categorised as unauthorised will be advised that the local Authority may issue a Fixed Penalty Notice. Parents are encouraged to buy work books from the school library for their child to complete during the period of absence and help their child to catch up on lost work once they have returned. In the event that a parent / carer can arrange for their children to be educated wherever they are for the duration of the absence they will need to provide evidence from the School that their child attended. The evidence should be a signed and stamped letter on official headed paper from the Headteacher. There will be no Fixed Penalty Notice issued. Parents must inform the school office by 8.45am on each day of absence. An answerphone message can be left for the school office. Parents must state the child’s name, class and a short explanation. Where the school has not been informed of the reasons for an absence on the day, the automated ‘Truancy Call’ system will be activated. This is where parents are requested to contact the school to explain the reason for the child’s absence. If no response is made, the school will phone or send a letter asking for a reason. If an answer is not received within one or two days, the absence will be recorded as unauthorised. All ‘unauthorised’ absences and ‘late after registers close’ absences are scrutinised by the Attendance Officer. If there are concerns over persistent absence the Attendance Officer may contact the family by letter or telephone and arrange a meeting to discuss the schools concerns. If a child is regularly absent due to illness the school may inform parents that any further illnesses reported to them will not be authorised unless they see a Doctor or have a Pharmacy First Appointment with a pharmacist and provide evidence to the school. Children should be brought to school in the morning then collected from school for the appointment. Once the appointment is over, the child should be returned to school. Whole or half day absence for short medical appointments is not accepted as a valid reason for absence and will be recorded as unauthorised unless there is evidence that the appointment will necessitate a half or whole day’s absence. Unavoidable absences, relating to the child can only be authorised at the discretion of the Headteacher. Persistent absence is where a child’s attendance falls below 95%. The Headteacher scrutinises the attendance records of all children and looks in detail at the records of those who have arrived late. Any child with a level of attendance below 90% will be closely monitored and a formal referral may be made to the Education Welfare Officer (EWO). The EWO or school may ‘cold call’ on absentees on any given day. This means visits may be made to the child’s home. If a child’s poor attendance persists then legal proceedings may follow, including the issuing of penalty notice. The school gates close at 9:00am, the same time as classroom doors close. Children arriving after this time will need to enter via the school office. Office staff record children who arrive late in the ‘Late book’ and will ask for a reason for lateness. Arriving late to class causes disruption to lessons, embarrasses the child and can result in a delayed start to learning of the day. More than five such incidents in a half term will prompt a letter of concern from the Headteacher. If a child arrives after 9.15am the registers will reflect this with a U code. This will be recorded as an ‘unauthorised’ absence for lateness in the register. Further late arrivals will prompt a discussion with the Headteacher and if 10 or more U codes occur within an 8 week period the school can issue a Fixed Penalty Notice. The school reserves the right to invite parents into school to discuss any attendance issues that raise potential safeguarding concerns, i.e. potential neglect, domestic violence, female genital mutilation, sexual exploitation, radicalisation. This may be a consideration particularly if a parent/carer requests a leave of absence during term time. In addition, if the school suspects that a pupil may be at potential risk as a result of their absence from school the Safeguarding team reserve the right to refer these concerns to the appropriate external agencies, ie – social care (MASH), police. The school will inform parents /carers if a referral is to be made. However, this may not be appropriate in every circumstance depending on the nature of the safeguarding concern and a referral may be made without informing the parent /carer. The school recognises that when a child goes missing from school it is a potential safeguarding concern and potentially an indicator of neglect including sexual abuse or exploitation. The school follows the LSCB procedures “Identifying and maintaining contact with children missing or at risk of going missing from Education 2013”. Under section 8h of the Education Regulations Act (2006). The school will make ‘reasonable’ enquiries into the location of pupils within 3 days of continuous unauthorised absence or for those who fail to return from leave of absence during term time. A referral will be made to the “Children Missing Education Team” to be investigated further by their safeguarding panel and appropriate interventions taken at that level, i.e. – refer to police. 1. Try to make all medical appointments (doctors, dentist and hospital) out of school time. Obviously this is not always possible but in such cases, try to minimise the disruption to the day by getting an early morning appointment so that your child can attend afterwards OR a late afternoon appointment so that she can complete most of her timetable before leaving. 2. Encourage your child to take responsibility for being on time for school. Try to make sure she/he has an alarm clock that is reliable. Make sure that she/he has a realistic bedtime and will not be too tired to get up in the morning for school. Bags, books and other equipment should be prepared the night before. Regularly checking with your child’s teacher can help you to do this. 3. Leave of absence during term time is not a parental right. If there are special or exceptional circumstances please contact the Headteacher and a decision will be made if the absence can be authorised or not. 4. Encourage your child to come to school even if she is feeling slightly unwell. Many aches and pains are forgotten when they are with friends and the school will contact you if it becomes necessary. 6. Take any worries seriously but do not show that you are unduly concerned. Believe that they will be sorted out. Contact your Child’s Teacher before the concerns escalate. 7. Bear in mind that children can easily fall into a habit of having the occasional day off and patterns of poor attendance are very hard to change. As a family, aim for 100% attendance. Gives a high status to good attendance and rewards children appropriately through stickers, charts and certificates. Offers Free breakfast club to support punctuality. The School’s Attendance Officer, has the responsibility for ensuring that all of the attendance data is accurately recorded on the SIMs attendance software. Regular meetings are held with the Headteacher to discuss all attendance concerns and appropriate actions are taken following these meetings such as letters sent to parents or meetings arranged to discuss attendance concerns with parents. The school has a legal responsibility to promote good attendance. Equally, parents have a duty to make sure that their children attend school regularly. Our staff are committed to working closely with parents as this is the best way to ensure as high a level of attendance as possible. Your continued support in this matter is essential.